"The Company's financial performance for the quarter ended September 30, 2016, improved compared to the sequential quarter ended June 30, 2016, as well as the comparable quarter in 2015. The departure from our New Jersey location, improved adjusted revenues and increased distillation production all contributed to our improved financial performance," said Grant Sahag, GlyEco's President and Chief Executive Officer. "We saw the benefit of the infrastructure improvements we made in the first half of 2016, as well as early positive indications from our new sales efforts. The completion of our Quality, Research, and Development Laboratory and the hiring of a new Vice President of Sales and Marketing were also important accomplishments during the quarter." Reached a new milestone of 74,000 gallons of monthly distillation production in September 2016. Average monthly distillation production was 63,000 gallons for the three months ended September 30, 2016. The Company's sales were $1.39 million for the quarter ended September 30, 2016, compared to $2.14 million for the quarter ended September 30, 2015, a decrease of $753 thousand or 35%. The decrease in sales was due to the impact of the closure of our former New Jersey processing center in 2015, partially offset by the addition of new customers. The Company realized a gross profit of $106 thousand for the quarter ended September 30, 2016, compared to a gross loss of $98 thousand for the same period ended September 30, 2015, as cost of goods sold decreased primarily as a result of the closure of the New Jersey processing facility in December 2015. 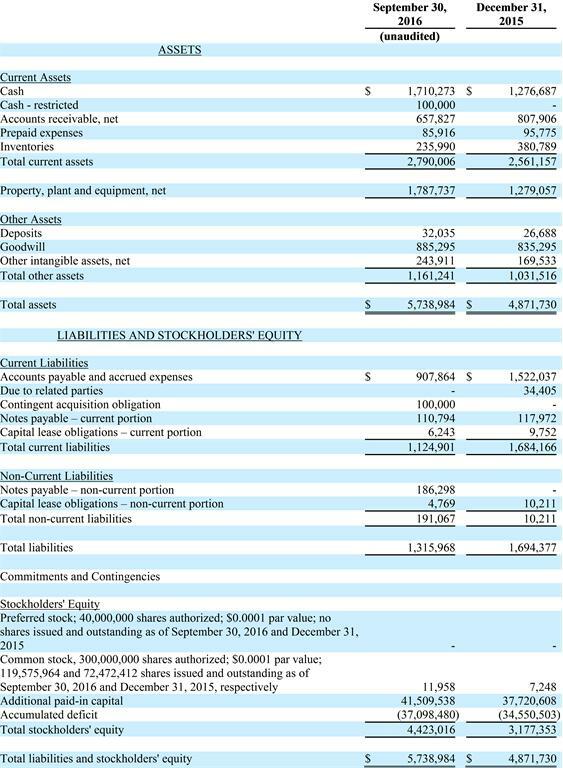 The Company reported an operating loss of $693 thousand for the quarter ended September 30, 2016, compared to a $694 thousand operating loss for the quarter ended September 30, 2015, as the improvement in gross margin was offset by increased operating expenses primarily related to salaries and wages. Salaries and wages increased year over year due to the hiring of a Chief Financial Officer, shifting technical consulting activities to full-time in-house resources, and transitioning the accounting of our technical team to corporate overhead. The Company reported a net loss of $699 thousand for the quarter ended September 30, 2016, compared to $734 thousand for the quarter ended September 30, 2015. The Company reported adjusted EBITDA of negative $336 thousand for the three months ended September 30, 2016, compared to negative $323 thousand for the three months ended September 30, 2015. The Company's sales were $4.15 million for the nine months ended September 30, 2016, compared to $5.53 million for the nine months ended September 30, 2015, a decrease of $1.38 million or 25%. The decrease in sales was due to the impact of the closure of our former Elizabeth, New Jersey processing center in 2015, partially offset by the addition of new customers. The Company realized a gross profit of $177 thousand for the nine months ended September 30, 2016, compared to a gross loss of $445 thousand for the same period ended June 30, 2015, as cost of goods sold decreased primarily as a result of the closure of our Elizabeth, New Jersey processing facility in December 2015. 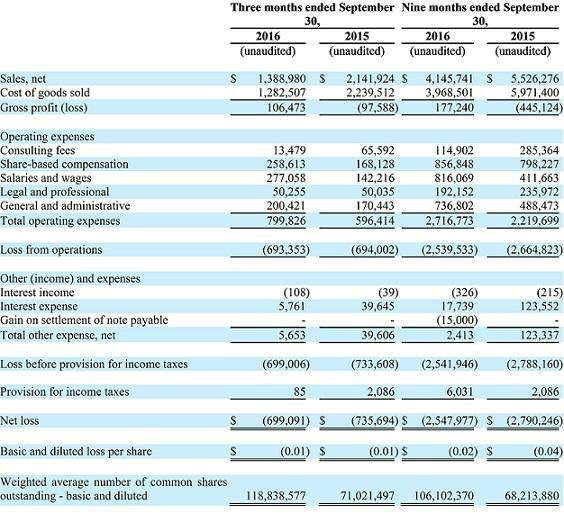 The Company reported an operating loss of $2.54 million for the nine months ended September 30, 2016, compared to a $2.66 million operating loss for the nine months ended September 30, 2015, as the improvement in gross margin was partially offset by increased operating expenses related to salaries and wages and general and administrative expenses. Salaries and wages increased year over year due to the hiring of a Chief Financial Officer, shifting technical consulting activities to full-time in-house resources, and transitioning the accounting of our technical to corporate overhead. General and administrative expenses increased year over year due to wind down costs related to our Elizabeth, New Jersey facility. The Company reported a net loss of $2.55 million for the nine months ended September 30, 2016, compared to $2.79 million for the nine months ended September 30, 2015. The Company reported adjusted EBITDA of negative $1.43 million for the nine months ended September 30, 2016, compared to negative $1.26 million for the nine months ended September 30, 2015. "After realigning our business model and investing in our six distribution facilities in the first half of 2016, we realized returns on those investments in the third quarter. In the first quarter, we refocused our business model on providing glycol solutions through a network of fully-integrated collection and direct-delivery channels, rather than a business so entrenched in the glycol commodity manufacturing business. In the second quarter, we invested in the operations, production capacity, and sales structure of that fully integrated network. In the third quarter, we realized returns on our investment in production and facilities, increasing our total production volume by over 33% from the second quarter of this year. Building from a base of our sales and customer service team, we added a Vice President of Sales and Marketing to construct a comprehensive sales organization and system. We expect to see the benefit of the sales team both in the size of customers we bring in and the price we sell to those customers for. We provide solutions to our customers, not just products, and we continue to hear from them that the convenience of our solutions are what strikes true to their needs. The 12% improvement in gross margin for both the three-month and nine-month periods ending September 30th, 2016 versus the same periods in 2015 indicate a stronger financial model and position for this company. To further increase that margin, we need to continue to see improvements in production and sales, along with cheaper raw materials and more efficient distribution of our products. The managing partners of our facilities are equipped to optimize existing business and grow through new business," said Grant Sahag, GlyEco's President and Chief Executive Officer..
"In concert with the realignment of our business model, we have continued to eliminate distractions and focus on innovation. We came to a settlement with the landlord at our previous New Jersey facility and expect to wind down the remaining items in the coming months. We also finished the build out of our Quality, Research, and Development Laboratory, which will allow us to lead innovation in the glycol space," Sahag added. "Our focus is clear. We must continue to decrease our raw material costs, produce at record volumes, attract larger customers while growing smart, attract and retain high quality members of our team, invest in our people through training, and innovate. We still have lots of work to do, but we have become smarter and better in our mission to be the best and brightest glycol recycling and distribution business in the country."